The size of the space —under 300sq. ft.— and the simplicity of the program, allowed us to understand the design in an equally simple way. And to render our solution by focusing on essential architectural ideas—material, form, assembly. We saw the lobby as a porch connecting inside and out. 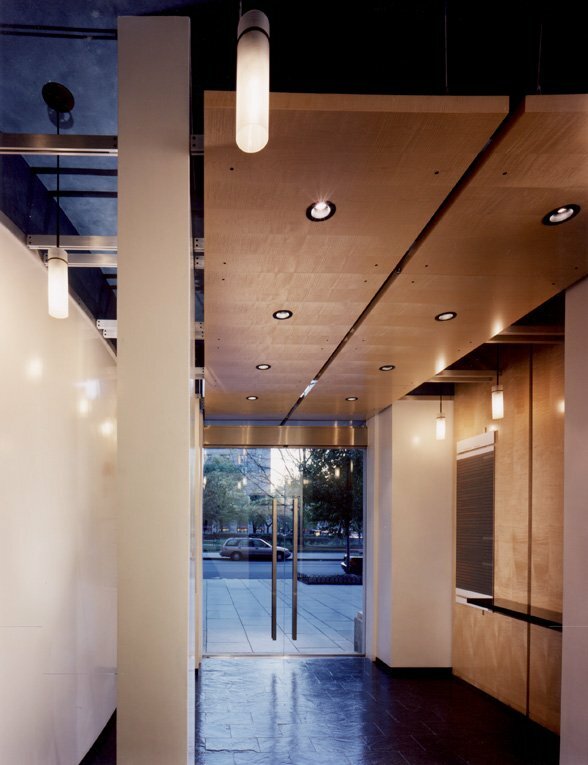 The canopy, which is both roof and ceiling, establishes the spatial connection between the street and the lobby. The ground plane is a cleft stone indicating its origin in the earth but ordered and therefore emblematic of the processes of construction. Finally, the blue of the sky gives way to the blue ceiling that floats above and encloses the assembly.